This was the beginning of the last gasp of regular DC reprint books, which would be phased out over the course of the next year or two as incoming new publisher Jenette Khan focused the company’s fortunes on new material. But this issue of DC SPECIAL was nonetheless a beloved read, filled with three stories, all of which were good. 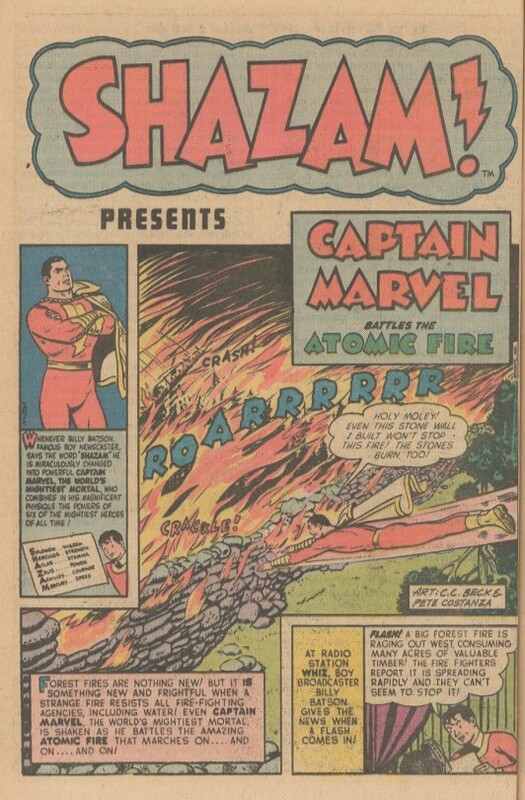 The third of those stories stars the original Captain Marvel, but DC could no longer refer to him by that name on its covers, so here he’s twice called by one of his nicknames, the World’s Mightiest Mortal, which is a little bit strange. 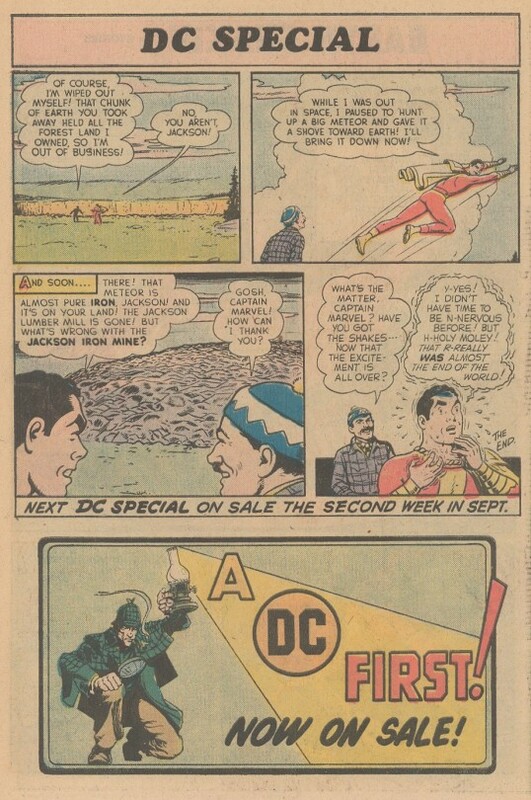 Apparently, nobody had yet settled on labeling him SHAZAM at this point. The three stories in this issue are only loosely connected by the broadest of themes: in this case Earth-Shaking Stories, whatever that means. But that broad mandate allowed editor E. Nelson Bridwell to simply select three good stories and not worry too much beyond that. 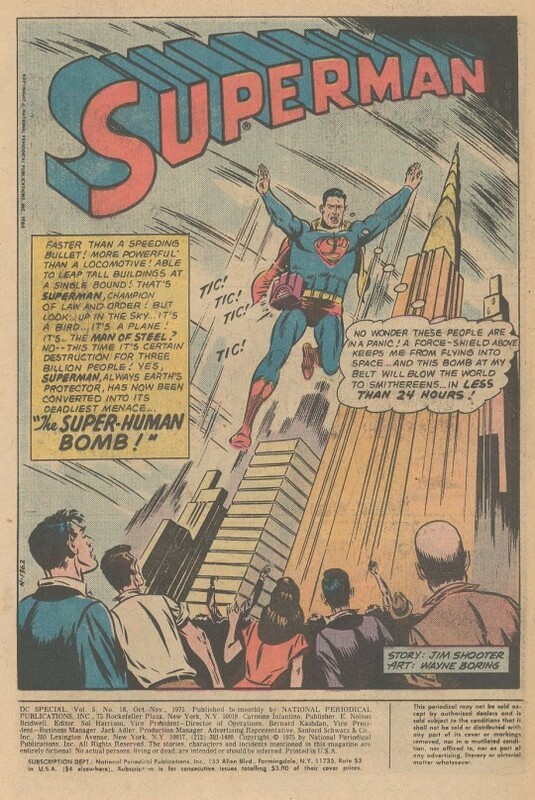 Up first is a mid-60s Superman entry by young writer Jim Shooter and vintage artist Wayne Boring. 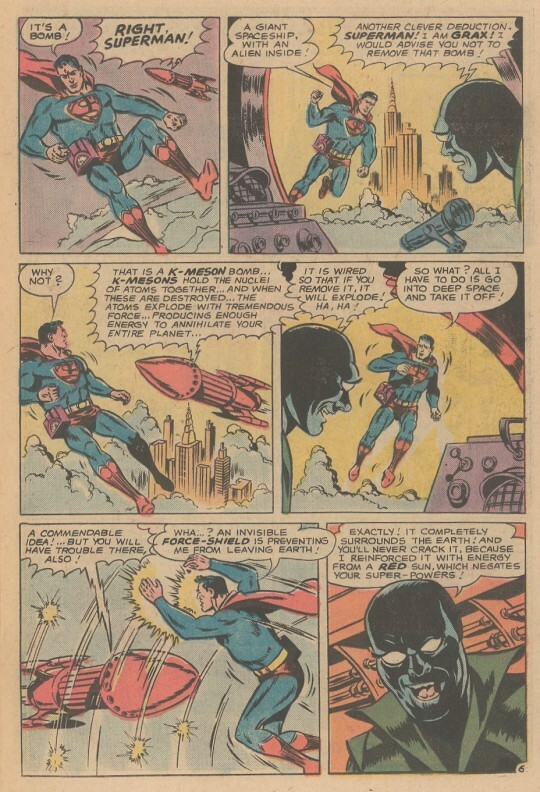 It’s an interesting combination, in that Boring’s work makes this story seem older than it is, but Shooter’s take was as modern as it came for Superman in this period of the 1960s. The story introduces Brainiac’s rival, the four-armed Grax, a space-being whose twentieth-level intellect far eclipses Brainiac’s twelfth-level genius. Grax steals Brainiac’s force-field technology (despite his mightier brain, he couldn’t quite duplicate it on his own), attaches a powerful K-Meson bomb to Superman’s belt that will explode in 24 hours, and seals off the Earth in the force-field, trapping Superman there. he knows the Man of Steel won’t be harmed physically, but he’ll be destroyed emotionally knowing that he could not save the Earth. After fruitless hours struggling in the trap, it’s only with the assistance of his enemy Brainiac that Superman is able to turn the tables and prevail. Next came a really great Green Lantern story that again teamed him up with his friend The Flash. 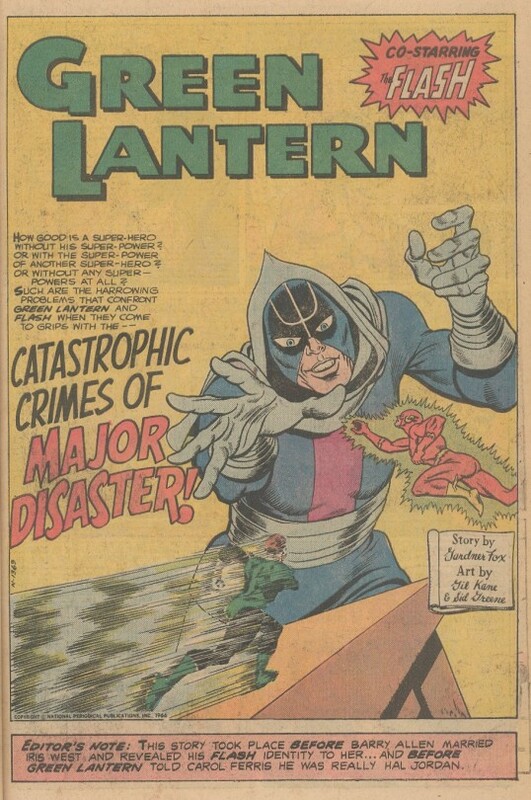 In the course of this story, as the pair contends with the villainous Major Disaster (who has learned all of their secrets after he steals GL’s mechanic friend Pieface’s GL Casebook diary)their secret identities are revealed to Iris West and Carol Ferris, they both lose their super-powers, and they each wind up with the abilities of each other. It’s a visual tour de force from artist Gil Kane. 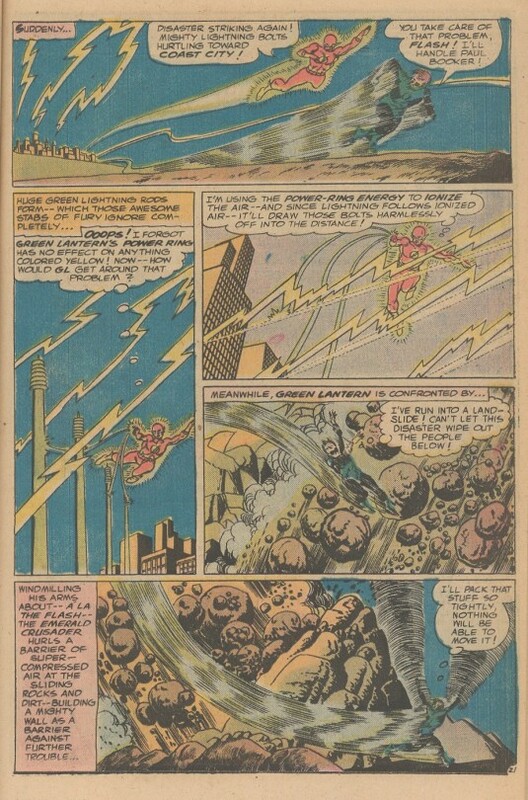 In particular, I was fascinated by the sequences in which the Flash and Green Lantern traded powers. It was a scenario that I would come back to often as I played with my own super hero action figures. By the end, of course, everything is returned to normal, Major Disaster is defeated and the status quo is maintained. But it’s an exciting ride getting there! The Captain Marvel tale confronted the Big Red Cheese (wonder why they didn’t call him THAT on the cover!) with a singular and fascinating problem: an atomic fire that burns at a molecular level, created by a disgruntled scientist to destroy John Jackson’s mill and forest if he’s not hired on as a fire-prevention specialist. The Atomic Fire resists all of Marvel’s efforts to contain it, burning away water and consuming Earth. And unfortunately, even the Atomic Fire Extinguisher the evil Professor provides cannot do the job. But Marvel has the solution: he carves out the hundred-mile chunk of the Earth that’s been set ablaze and hurls it into the sun. Catastrophe averted! There’s a great bit right at the end of the story where, having contained the disaster, Captain Marvel gets the shakes as he realizes how close the Earth came to annihilation now that he’s not focused on solving the problem.